Once a customer goes live in a full-cloud scenario with Employee Central, EC then becomes the system of record for organizational data including positions and jobs. Since EC is the core system for organizational data, the Point to Point (PTP) framework used for Employee Central Payroll (ECP) data replication does not maintain org tables HRP1000 and HRP1001 with all of the org relationships normally found on-premise. To address this requirement, SAP provides a standard PTP report for replicating job and position texts called RP_HRSFEC_JOB_POS_REPL. It is briefly covered in the ECP implementation guide and I wanted to cover it in a bit more detail. Please note, there are two ways to run this report: automatically and manually. 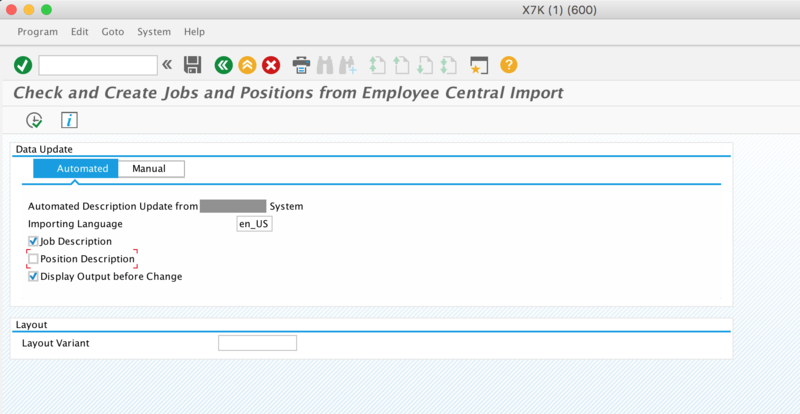 In this blog I will focus on the automated method which uses the PTP connection and SuccessFactors OData APIs to retrieve the position and job data from Employee Central without any flat file. The manual method involves exporting the job and position data from Employee Central and manually importing them into the report. The report RP_HRSFEC_JOB_POS_REPL can be run either before, during, or after you start replicating employee data. So if you already replicated employee data to your system – that is okay! If you replicate employee data to ECP without first running the report RP_HRSFEC_JOB_POS_REPL, a standard employee’s IT0001 in Employee Central Payroll will look like this. Notice the employee’s position and job titles have a generic string such as EC_XXXXXXXX. This is because when the employee’s data came over, and the PTP framework saw the position and job org object didn’t exist in ECP, it automatically created that position and job with a default title. To clean this up, we will run the Job and Position replication report. Using transaction SM30, ensure Table T77S0 has the following switch checked. This switch enables Job and Position Replication to ECP. Ensure the connection to EC is successfully setup via transaction HRSFEC_PTP_CONFIG. This should have been completed previously when setting up your employee data replication. More details can be found in my blog, Setting up PTP Connection to Employee Central Payroll. To run the report, go to transaction SE38 and execute RP_HRSFEC_JOB_POS_REPL. Importing Language – Select the locale / language for the titles you want to bring from EC. You can only select one language at a time, so if you are supporting multiple languages you will need to run this report multiple times. Display Output before Change – Checking this box will give you a chance to preview the data retrieved from EC before saving it. If creating a variant of this program to run in the background, keep this unchecked. When the report is executed, an OData API call will be made to SuccessFactors to retrieve all of the positions and jobs. As proof of this, you can see the calls made in Employee Central’s OData API Audit Log. If you checked the “Display Data before Change” box, you will see a preview of the data imported from SuccessFactors as shown below. To save these new jobs and positions to your ECP system, be sure to click the Update button in the top right corner. After executing this report, the job and position titles should now be updated and available in the ECP tables T528T and T513S. And now if we look at an employee’s Job and Position data in IT0001 it will look like this (please note, Org Unit is not included in this report). Since new positions and jobs will be added to EC periodically, it is recommended to schedule this report to run in the background on a periodic basis (hourly, daily, or more frequently depending on your requirements). This will ensure ECP always has the latest position and job titles. This can be done using transaction SM36 to schedule variants of report RP_HRSFEC_JOB_POS_REPL. If you have an international implementation spanning multiple languages, it is recommended to create a different variant for each language. Since this report uses the exact same connection as the employee data replication report, all connection details will be maintained using transaction HRSFEC_PTP_CONFIG. If your SFAPI user’s login details ever change, be sure to always keep this transaction up to date. 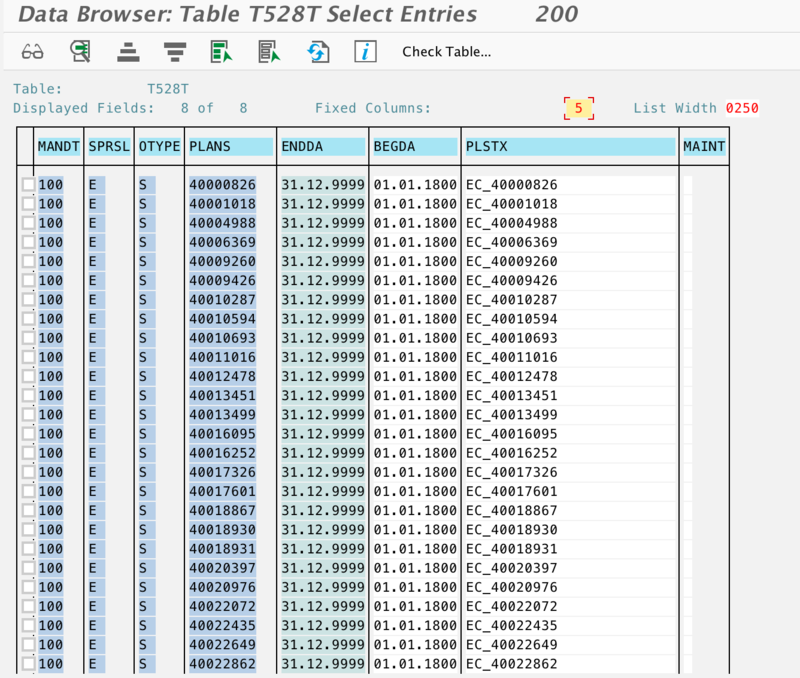 When a position or job is replicated from Employee Central, the ECP system first checks for a mapping for the EC position or job in table HRSFEC_JOB_POS. This table serves as the key mapping between Employee Central and Employee Central Payroll’s job and position numbers. If a mapping does not exist at the time of replication, the report will create a new one in the table. Please note, at this time, the job and position numbers between EC and ECP systems will differ. In EC Job and Position codes can be set manually however in ECP they are system generated. As SAP describes in Note 2499235, there seems to be no plan at this time to keep these codes in sync between systems. 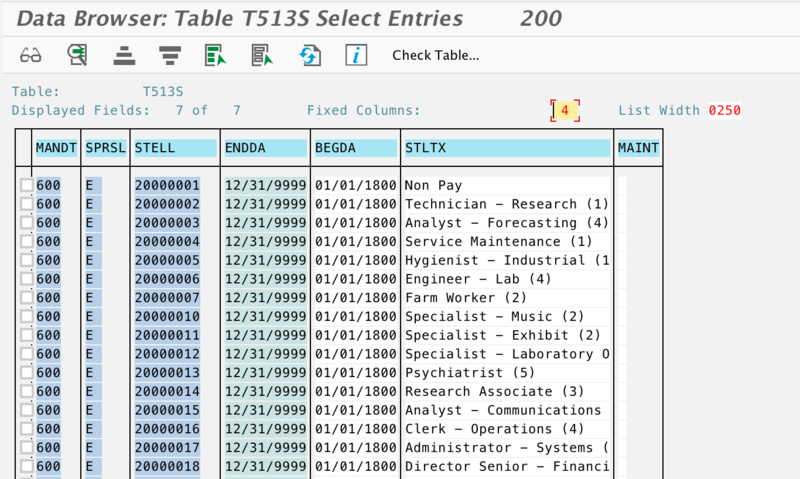 However, if you have interfaces which need to do a lookup of job or position titles and you have the EC numbering, you can use table HRSFEC_JOB_POS as a crosswalk between the two. I hope this helps bring some clarity to the position and job replication available via PTP! UPDATE 7/10: A previous version of this blog discussed a custom enhancement to replicate org and position texts. I am repurposing this blog to focus on the standard PTP report for jobs and position titles – which has lower risk for customer implementation. It is found, from Q1 2018 Implementation Guide section 9.7.1.1 Checking and Creating Jobs and Positions Imported from Employee Central, there is a report ‘Check and Create Jobs and Positions from Employee Central Import (RP_HRSFEC_JOB_POS_REPL)’ to import EC job and position master data to ECP. Just would like to know if it is serving the same as your blog. Yes – report RP_HRSFEC_JOB_POS_REPL is the standard PTP report for replicating position and jobs from Employee Central to Employee Central Payroll. I updated the blog with more details on the report, including my experiences using it. I understand that this program transfer position and job details. Is there any means to transfer org unit as well.